Mitzvah Day is a wonderful opportunity for you to participate in the holy task of tikkun olam, repairing the world. Mitzvah Day is a concerted effort, on a single day, to bring the entire congregation together to spend one day volunteering with social justice projects and activities in the community. 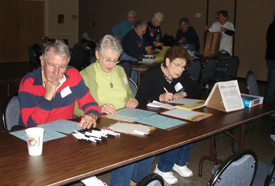 Congregants choose from a variety of projects that cater to diverse interests, capabilities, and ages. 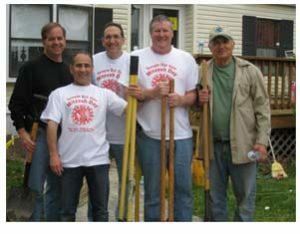 Projects in the past have benefited Diakonia, Children’s House by the Sea, Agape, Coastal Hospice and the Salisbury Zoo. Mitzvah Day participant’s have written letters of support to our troops abroad (pictured right), baked treats for dogs and cats at the Worcester County Humane Society and helped clean up our seashore. A few members of the Mitzvah Day Ramp Crew. 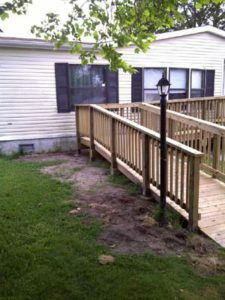 This project involved planning and building a ramp for a TBY congregant.